Happy Friday! I leave you with this photo of my ugly dresser drawer handle (it goes on this guy). The two hardware stores I stopped by last night didn't have any sleek, modern pulls that would fit the current holes (which are very large, and I'm not ambitious enough to try to fill them and drill new ones). So I'm stuck with the original "fancy" ones. The only gold/brass metallic spray paint I found, other than Krylon I don't like much, was Rustoleum's Universal Metallic in Pure Gold. It looks like this. Nope. I'll paint them some other color tomorrow. UPDATE: Now they're navy. I'm calling it a day. You must be nuts* - those are lovely. Why switch them for generic modern sticks? I'm with Grandma G...I think you might like them better in a dark color. I think those handles are lovely! I think they'd look great if you paint them hot pink! I think I'll get a team together to convince you to go with navy! Rachel, where are you? When I was stuck with drawer pulls I hated in a non-standard, hard-to-replace size, I threaded wide organza ribbon through the holes to make drawer pulls as a temporary fix. It worked so well I never did replace them. Maybe that would work for you. If you don't like organza, you could use colorful rope or heavy upholstery cord. oh. I kinda love them! Don't change them. Or maybe try some sort of rope/yarn/ribbon? I have the same "holes too widely spaced for current hardware" issue in my 1961 kitchen. 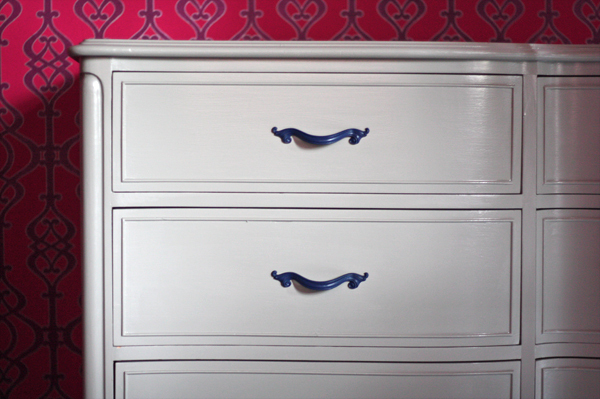 If you google "adjustable drawer pulls" you'll find loads of sleek modern designs that will work on your dresser. If not that, then I'm on Team Navy! Those pulls are GORGEOUS!!! I hope you keep them. I think they will go great with all the other layers you have going on and play nicely with all the other vintage details in the rooms. If the furniture is the 'outfit' then the draw pulls are surely 'the earrings'. With that analogy in mind I would like you to try to imagine the downtown girls with sleek modern earrings instead of delicate precious drops. Sometimes items being 'a grower' makes them more precious in the long term. Furniture philosophy! You heard it here first. You'll make it look lovely whatever you decide. Sorry, just love these handles!! Um, I don't have a Bachelor of Science in Interior Design but I like 'em. I vote keep them! I like the style of them and they mimic the curves of the dresser. Why not try some Martha Stewart Liquid Gilding? 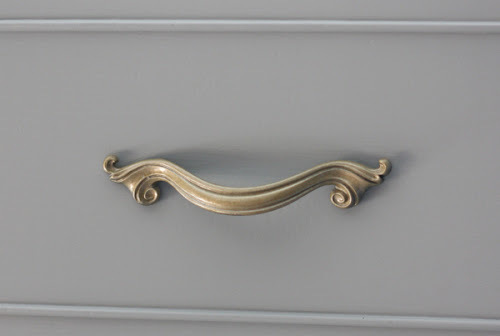 It looks great on pieces with nooks and crannies like your drawer pulls and it comes in several metals. I don't recommend it for smooth items. I like the suggestion some people made about using ribbon or rope as a handle. The current handles aren't bad at all, but I think it would be more modern with something else. It'll look great either way! I've never used Rub 'n Buff, but a product like that might work and come in a shade of gold. I quite like them, but what about some heavy chain? You could even thread navy ribbon through the links to keep them from rattling or marking the wood. :) me & Grandma G for the win. I like it. Have you thought of painting them silver/nickel? or how about a distressed white or off-white? If you don't like them anyways, might as well try it! Lots of good ideas posted here!